SUNSPOT WATCH: A pair of big sunspot groups has emerged over the sun's eastern limb. One of them, number 634, unleashed an M-class solar flare on June 13th. This could signal a period of increased solar activity in the days ahead. They captured this image 2 minutes after fourth contact. The solar chromosphere juts above the black edge of a coronagraph, which blots out the Sun's bright disk. 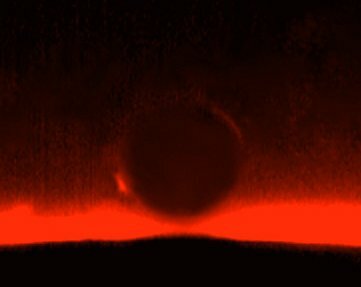 See the fiery ring around Venus? That's sunlight filtering through the planet's atmosphere. Amazing! 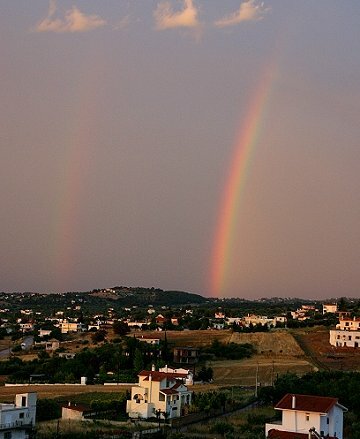 "Because rainbows appear opposite the sun, sunset rainbows ride high in the sky and often look huge," explains atmospheric optics expert Les Cowley, "but in fact all rainbows are the same size with a primary radius of 42�." "Sunset rainbows are also red," he adds. "Notice how the reds of the primary bow at right and the secondary bow at left face one another? The secondary bow, made by light reflected twice inside raindrops, has reversed colors. Why is the sky darker between the bows? The Greek Alexander of Aphrodisias first recorded the dark band 1800 years ago." You are visitor number 32634145 since January 2000.